According to the CSA Shows website The Show at Chantilly will take place Friday through Sunday, October 14th to the 16th, 2016. Cost of admission on Friday is $5 from 2:00 p.m. to 6:00 p.m. Admission on Friday is free with Advance Ticket Purchase and also free between 6:00 p.m. to 8:00 p.m.
On Saturday the cost of admission is $10 from 9:00 a.m. to 3:00 p.m. and is free between 3:00 p.m. to 5:00 p.m.
On Sunday the cost of admission is $10 from 10:00 a.m. to 2:00 p.m. and is free between 2:00 p.m. and 4:00 p.m. Weekend Passes are also available: $20 at the door or $15 in advance. Kids 12 years old and under are admitted free. Please visit the CSA Shows Guests, Schedule and Pricing page for complete details. There you will find descriptions of small flats, large flats, mini items, premium items, inscriptions and other important information. Photo ops will be taken by a professional photographer. An inscription ticket must be accompanied by an autograph ticket. Steve Largent, is a Pro Football Hall of Famer and a former U.S. Congressman, having served in the U.S. House of Representatives for Oklahoma from 1994 until 2002. He made an unsuccessful run for Governor of Oklahoma in 2002. Largent spent 13 years with the Seattle Seahawks. He was selected to the NFL Pro Bowl seven times, and was the first Seahawk to earn that honor. When Largent retired, he held all major NFL receiving records, including: most receptions in a career (819), most receiving yards in a career (13,089), and most touchdown receptions (100). Steve Largent was inducted into the Pro Football Hall of Fame in 1995. In 1999, he was ranked number 46 on The Sporting News’ list of the 100 Greatest Football Players he was the only Seahawk on the list. PFP Sports & Celebrity Talent Agency is a top booking agent for motivational sports speakers and celebrities. 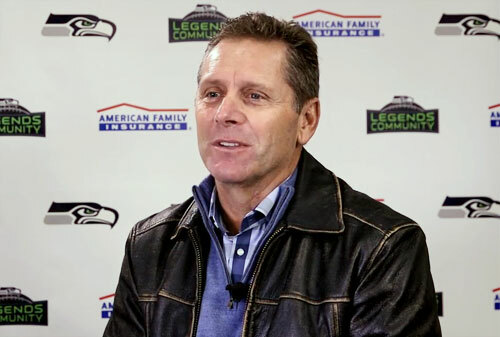 If you would like to book NFL stars like Steve Largent for a speaking engagement, personal appearance or special event, you can request Steve Largent agent and speaker information from PFP Sports & Celebrity Talent or call 800.966.1380.